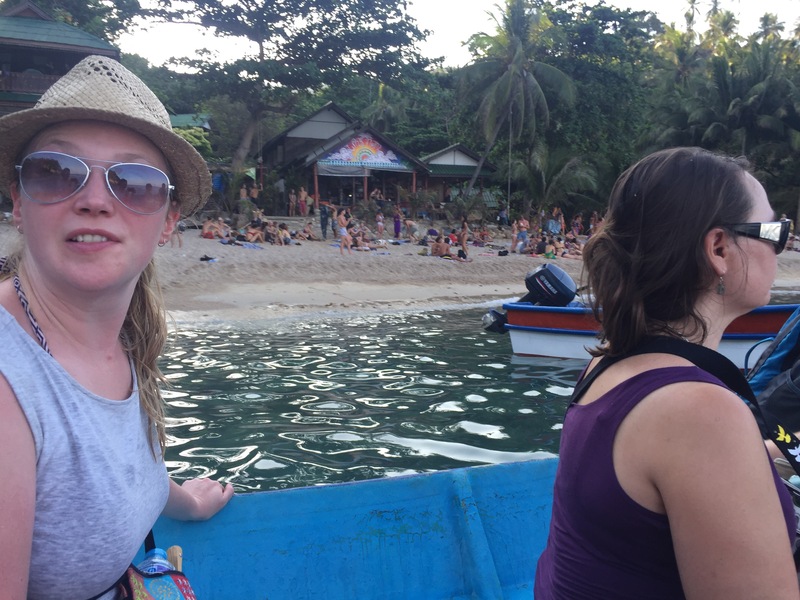 We took the ferry from Koh Samui to Haad Rin, the site of the infamous full moon parties. 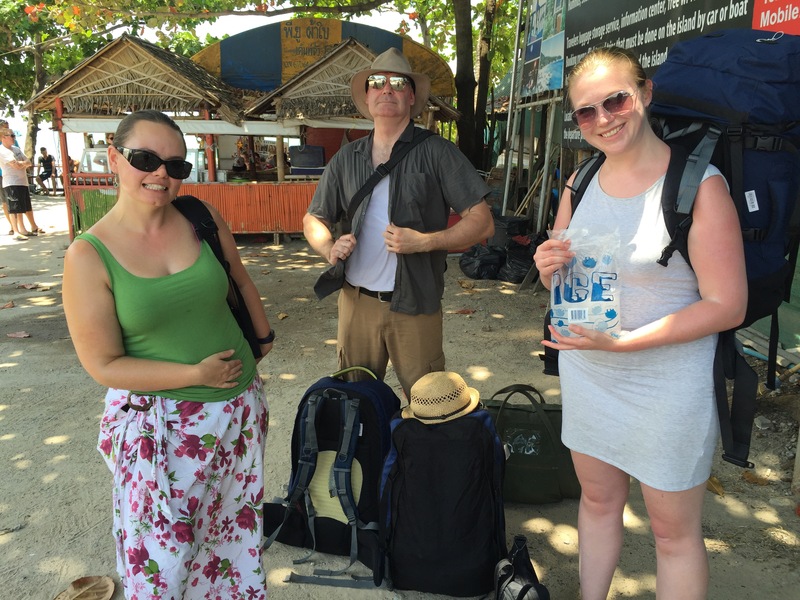 It was a steaming hot day (as always) and we all had big bags to drag or packs to carry – except for Charmaine with her sore shoulder. Sledge carried her bag and his everywhere we went, which was extremely kind of him. The ferry ride was about an hour, then we walked through Haad Rin to the other side of the headland where we caught a taxi boat to our destination, a couple of beaches up. The place we were heading is a little legendary amongst our friends. Luke and I had not been there before but Nicolette had, and our friend Ben was already there. For years people we knew had been going there to chill out and party. It’s a relatively quiet beach with cheap accommodation and only one proper resort. Few of the cheap places can be booked ahead – you just have to turn up and hope there’s room. Due to a miscommunication about whether or not others had booked, Charmaine had found one place that would take reservations and booked rooms for us, Lauren, Kupp, Toby and herself. The others wanted to wait until we got there. 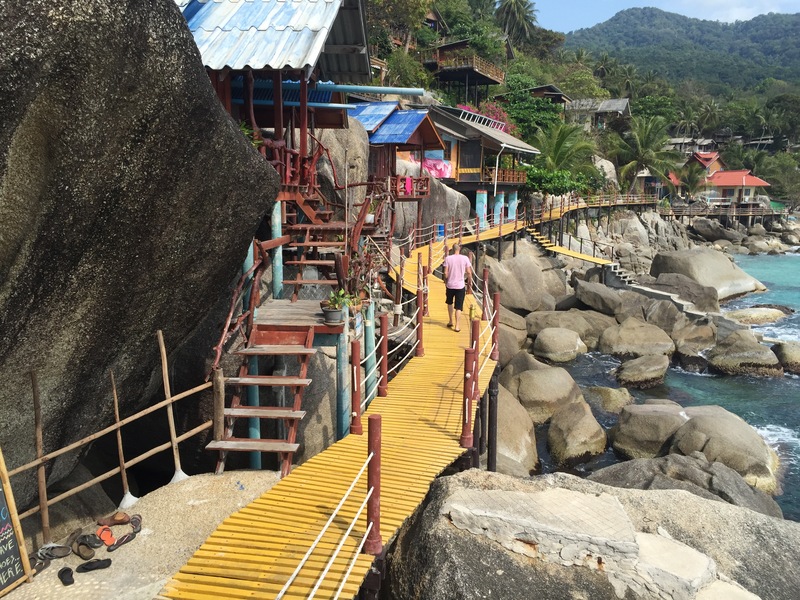 The place we had booked was set along the headland beyond the beach, with a string of bungalows perched along a boardwalk on rocks. When we arrived on the beach we found that the place we were staying was at the furthest point from anything else and that end of the beach had the worst piles of rubbish. It didn’t look terribly inviting, but we hauled our bags along the sand then the boardwalk and check in. The managers, Peter and Demi, were a lovely couple and were the most redeeming feature of the property. 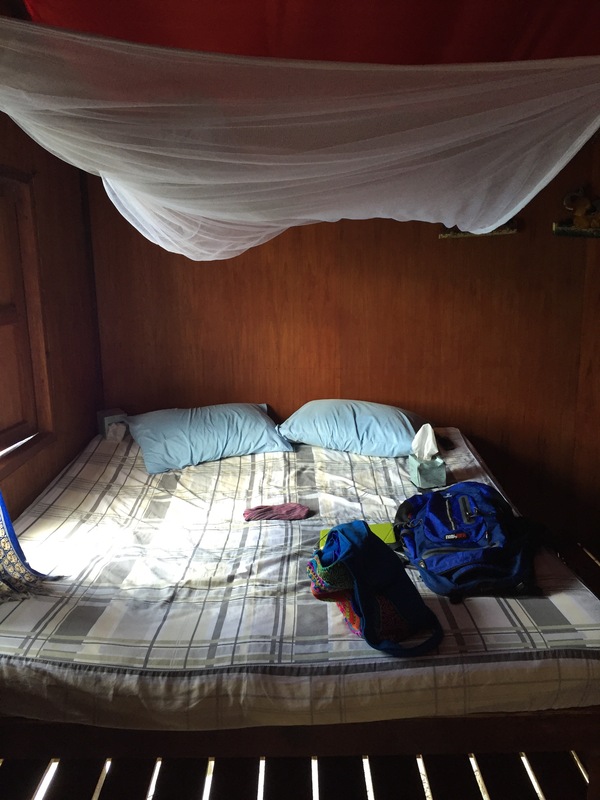 Despite being only $20 a night, our rooms felt like poor value. There was no aircon (we didn’t expect any, fortunately), the floorboards were far enough apart to make dropping your phone onto rocks below a real possibility, there was no hot water – and no water pressure, the toilets were flushed by using the bucket that was under the tiny shower hose, which meant waiting ages to get enough water to actually properly flush. I wish I’d taken a photo of the bathroom, but I only got one of the bed. The mosquito nets had holes, the window had no glass or flyscreen and the taxi boats zoomed past all day and night with their incredibly loud motors. But none of these things mattered hugely or were terribly unexpected. The one thing I had trouble coping with was the hardness of the bed. It genuinely felt like a board with a blanket or two thrown over it. I sleep on my side normally but couldn’t because it was so hard – but my back was sunburned pretty badly so lying on my back was painful. It wasn’t a great start! On the up side, the deck where we ate breakfast (and then spent half of each day lazing and reading) was quite lovely. It had a view of the beach and many fish swam around the rocks below. The food and drinks were cheap and Peter and Demi often came and sat with us and chatted. 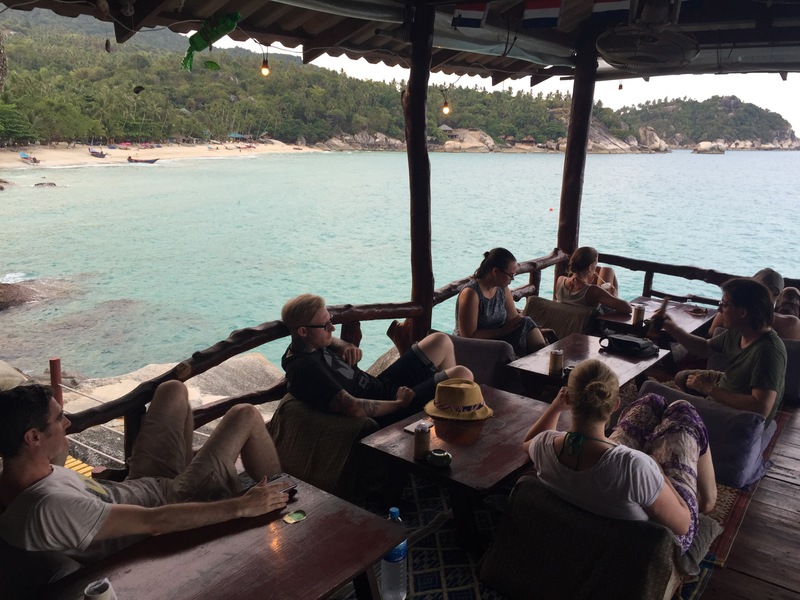 In fact my favourite evening on Koh Phanang was when everyone else went out for dinner and I stayed back and had a long talk with Demi and heard about her life and how she’d ended up in Thailand. Up until that point I’d not been particularly charmed, but talking to Demi was lovely and I started to see why people I know liked hanging out in such a chilled place and getting to know people from around the world. There seemed to be many nationalities there, mostly people a fair bit younger than me. I think that I probably would’ve loved a place like that ten years ago, but on a short holiday where my goal was to be comfortable and relax, it wasn’t really what I was looking for. Also, Demi said that the place was in decline, with rich people buying up property and plans for development, along with richer tourists ruining the scene. We did a couple of things while we were there. On our last day, for a special birthday lunch, we went to a place called ‘The Sanctuary’ at a nearby beach. 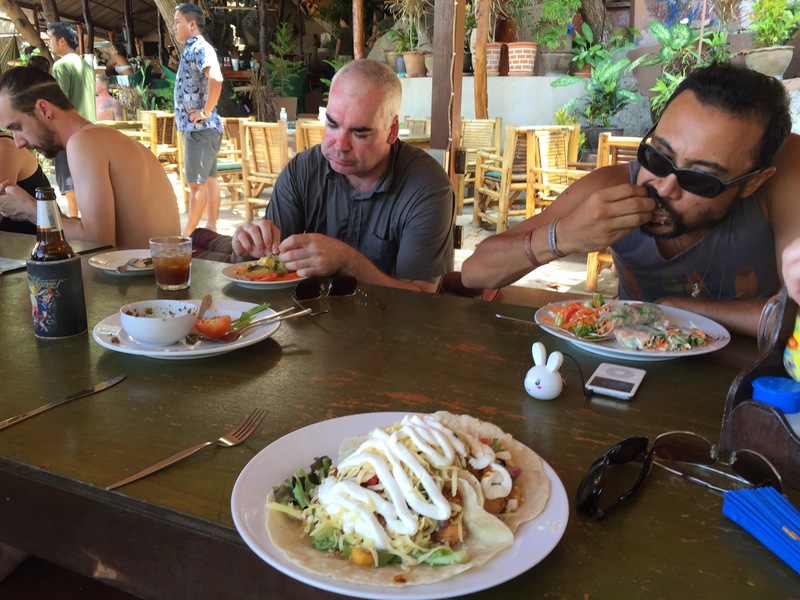 It was a yoga retreat that excelled in pretentiousness but had a good restaurant with two menus, one with healthy but normal food, and one with a special diet for people who’d been fasting and having enemas. It was entertaining to watch the crowd – so many rich hippies! – and laugh at the menu items. My fish tacos were delicious! After that we walked over the hill to the next beach where there was a day party happening. Gentle electronic music and about 100 people, all swimming and dancing and having fun. It was a very pleasant way to spend an afternoon, but I couldn’t help wondering what happened to all the rubbish at the end of the day. If our beach was anything to go by it was just left where it was. I can totally see what about this place appeals to people. 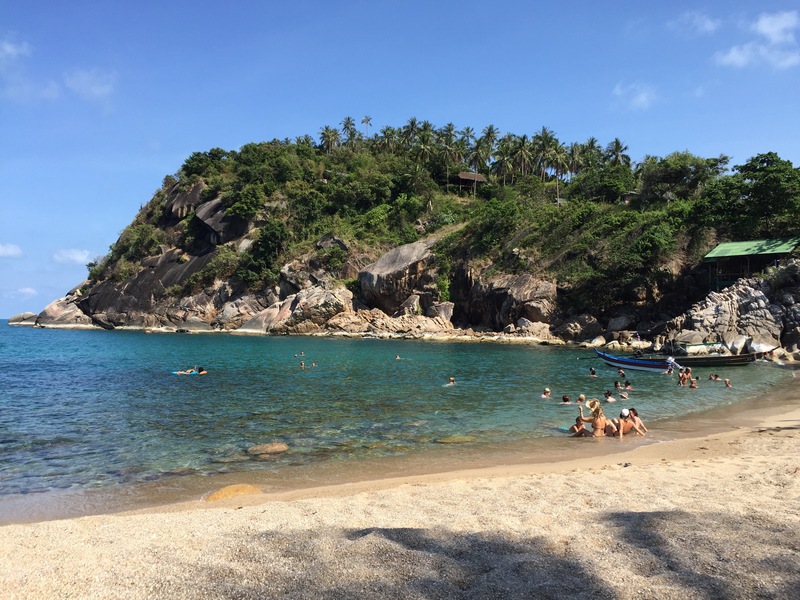 It’s cheap, the crowd are interesting and young, there’s no sense of commercialism and the water is beautiful – pure aqua and super warm, with few rocks or seaweed. There was something in the water that did bite or sting though – we never really figured out exactly what it was, whether spores or bugs, but nearly everyone felt it even though it left no mark. After a few days the lack of aircon didn’t matter and I got used to the Indian-style seating (those triangular pillow/cushion things) and never feeling very clean, but I think it just wasn’t the right time for me to enjoy a place like that. It’s the kind of place people go to escape reality and party, whereas I was on a short timeline and wanted a comfortable bed and things to do. 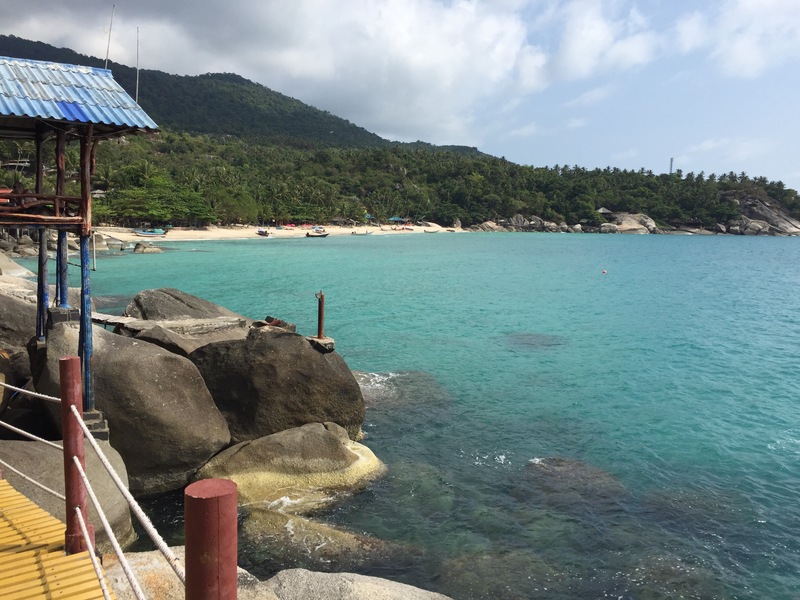 A few of us decided we’d rather book somewhere nice in Koh Samui, so Luke found an Airbnb place online, and after our four nights were up, we took a taxi boat then the ferry and headed back to the bigger island, waving goodbye to the larger part of our crew. 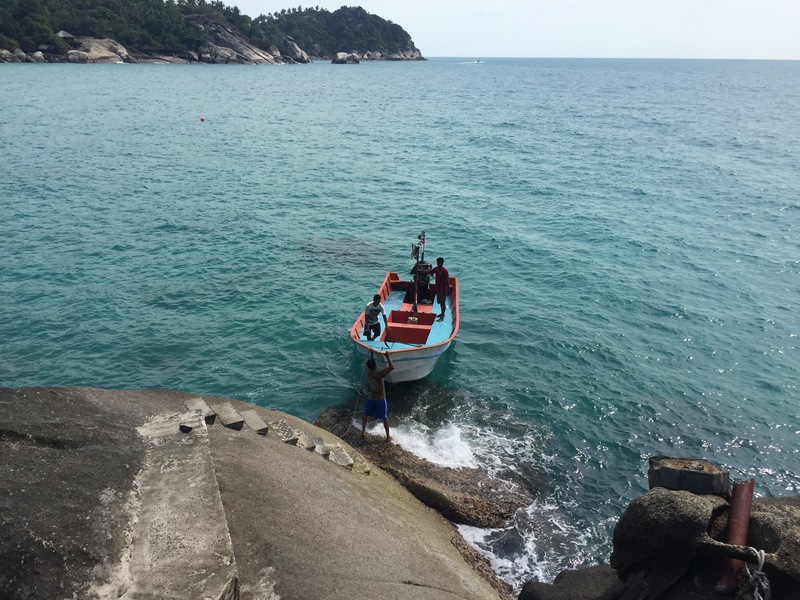 The last photo is of is the rock where the taxi boats pull up at our accommodation. Somewhat precarious!